Single or dual circuit with energy efficient EC fans. These heat exchangers are identical to outdoor condensers – with the exception of the compressor being located outdoors instead of inside the evaporator. Units from 11 – 176 kW. Unit cabinets are constructed of heavy duty aluminum, thoroughly reinforced with riveted gussets. Mounting legs are constructed of heavy duty aluminum and are shipped with the unit for field installation. The condensing unit contains a scroll compressor with crankcase heater, filter drier, sight glass and condenser coil. The condenser coil is constructed of plate type die formed, aluminum fins mechanically bonded to copper tubes and employ full height, self-spacing collars which completely cover the tube surface. The coil is pressure and leak tested at 425 PSIG air under warm water, evacuated, dehydrated, and sealed with caps on connections. All motors are factory wired with leads terminating in a weather protected junction box located on the outside of the unit casing. Fan motors are _ horsepower, 1075 RPM. All Data Aire DRCU type condensing units are E.T.L. listed. These heat exchangers are identical to outdoor condensers with the exception of the compressor being located outdoors rather than inside the evaporator. 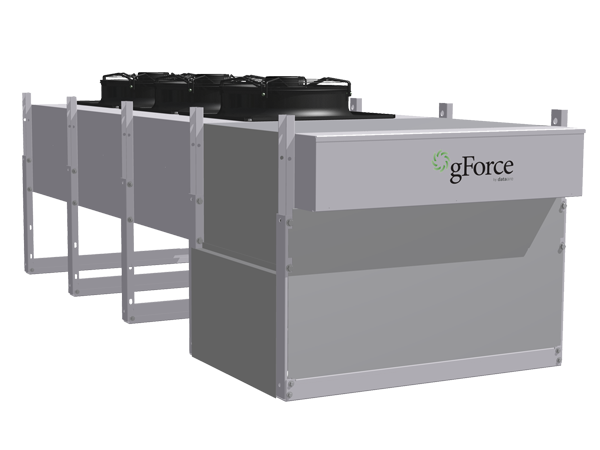 Like condensers, condensing units have aluminum housings, aluminum finned copper tube coils, and powder coated fan guards. Available with either thermally protected direct drive fan motors or energy efficient electronically commutated (EC) fan motors.